Like most of those who toiled away in West Coast’s defensive half, Butler wasn’t called upon very often. When he was, his disposal was better than most in what were difficult conditions. Had 13 disposals. Made the most of limited opportunities to kick the two goals that Adam Simpson would have demanded of him. Cripps gave away another goal and provided his trademark forward pressure that contributed so much towards West Coast’s victory, laying six tackles. A very quiet day from one of West Coast’s most feared weapons. Just six disposals and one goal for the day, though he did provide a target and chased hard when Hawthorn had possession, laying five tackles. Didn’t have much to do, but looked unusually rushed when in possession. Spent plenty of time on the bench and would have been the favourite to take the red vest had West Coast not decided to rest Will Schofield’s dodgy hamstring. Clinical. Had 24 possessions, unusually, half of them contested. Was brought into the scraps more than he might have liked, but was involved in most of the Eagles’ forward thrusts as he floated past on the left. Was equal team leader for clearances in Matthew Priddis’ absence with six. The mercurial forward did everything Adam Simpson could have hoped for, creating goals when none had seemed possible at the most opportune of moments. His first – also the Eagles’ first – set the scene for the pressure West Coast would bring to bear on Hawthorn and his third – an audacious final-quarter volley – was the icing on the blue-and-gold cake. Superb off half-back. Consistently repelled Hawthorn’s attacking forays and set up plenty of West Coast’s forward thrusts. Early in the match when the heat was on, Hurn showed his class by hitting targets when others around him were unable to do so. Was also a reliable mark when Hawthorn bombed the ball forward. Went head-to-head with Sam Mitchell and may have looked silly had the rub of the green not been with the Eagles on the night. Mitchell had 35 disposals, but Hutchings had 24 of his own and was fantastic when running forward, pumping the ball inside 50 on seven occasions. Had six clearances. Did enough on the night. Kennedy worked as hard as always to provide West Coast with an option, but he did waste a couple of opportunities to make it a big night. Had Brian Lake beaten all ends up in the first half, but found the going somewhat tougher in the second half when opposed to James Frawley. Took nine marks. Was at his dangerous best, gathering marks at will and providing a constant headache for the Hawks defenders. Should probably have kicked another couple of goals himself, but was instrumental in setting up others. Took nine marks, many of them around half-forward. The sub. There’s not much you can say about a bloke who came on to the ground with 10 minutes left in the game. Had two handballs. It was a quiet night for one of the league’s best intercept marks. Spent much of the first quarter in the rooms, where he received treatment to the left shoulder he injured against Adelaide. Returned, but looked sore and was fortunately given little to do. While his rucking influence was blunted in the first half, his attack on the ball was unbelievable. He had 12 possessions for the night – all of them contested – and played his best football in the third quarter, when West Coast put the game beyond Hawthorn’s reach. Opposition teams will want to look closely at the way in which Hawthorn went third-man-up in the first half, but there was nothing they could do to stop his overall influence around the contest. Still finished with 40 hit-outs and five clearances. Running off the wing, Rosa provided West Coast with the outside run that was always going to be needed to beat Hawthorn. Was cool when in possession and provided an outlet deep in defence on the rare occasion that Hawthorn surged forward. Did all that could have been asked of him in the circumstances. Was as an integral part of the Eagles’ team defence system on the night, matching up on all of Hawthorn’s talls at various times. Was rarely required to make one of his customary dashes out of defence. Subbed out of the game late in the last quarter. Five days after playing in a WAFL elimination final, Selwood went quietly about his business. Collected 19 disposals, 11 of them contested, and was typically at home at the bottom of a pack. Will be better for the run after an injury-interrupted season. Was at his best when on the end of a chain of handballs wide of the contest, receiving 12 handballs and collecting 16 uncontested possessions in total. 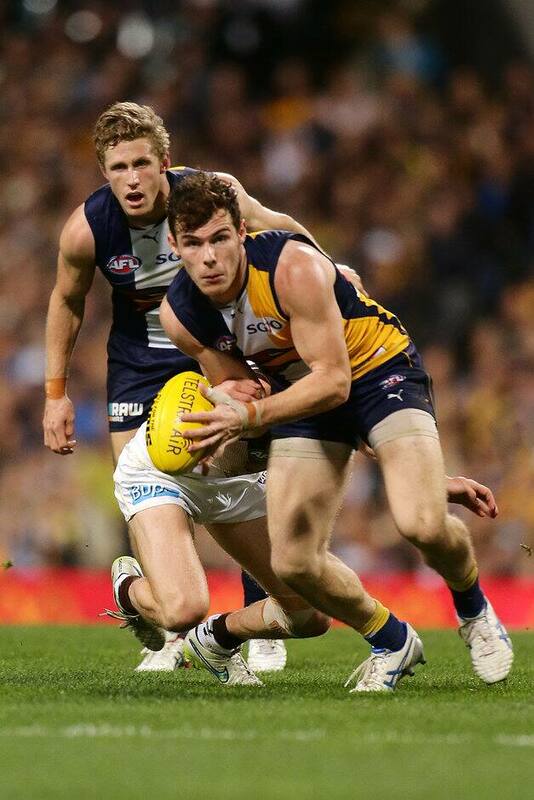 Wasn’t as clinical as he can be by foot, but constituted another cog in West Coast’s well-oiled machine on the night. Spoiled everything that came anywhere near him. As always, he took on much bigger players and regularly beat them. If there was a single moment that exemplified his night, it was when he was opposed to the much bigger Jarryd Roughead in the last quarter and managed to keep the ball behind him, bouncing off and beating Roughead back to the ball. His reading of the ball allowed him to cover for the injured McGovern. Another scintillating game from the fleet-footed midfielder. Worked well in tandem with Nic Naitanui and was at his usual best when running forward. Was clean in taking possession when others weren’t and should have hit the scoreboard on a couple of occasions. Finished with 25 possessions and six clearances. Did his job when called upon to ruck, proving the equal of both Ben McEvoy and David Hale. Provided a marking target, but was unable to hold on to them in slippery conditions. His disposal was wayward, at times. Was clean around the contest and put on plenty of pressure. Like most of West Coast’s defensive players, Wellingham was most prominent in the first quarter when Hawthorn had most of its opportunities. Spent most of the rest of the match as a link player, gathering 15 possessions. Yeo was at his best in the first quarter when the game was there to be won, gathering seven touches and kicking a goal. Jumped from deep at everything in the air and provided West Coast with some pace across the ground. Was also good when West Coast had the wind in the third term. Finished with 19 possessions.